The crowns of the teeth could be affected by multiple previous restorations, decay and trauma, resulting in loss of shape of the crown which affects the smile, articulation and mastication. These prostheses are designed to restore your smile, enable your speech and mastication (food chewing and eating). When decay has become so advanced that a portion of a tooth breaks off or must be removed, a dental crown or bridge (for more than one tooth) may be the answer. Crafted from materials that include ceramic, porcelain, gold and metal alloys, and zirconia, a dental crown is a protective restoration made to restore a tooth’s function and appearance, and with proper care can last for many years. At the Wentworth Clinic, our cosmetic dentistry dept utilises E-max crown – an all-ceramic crown crafted from a single block of lithium disilicate ceramic. 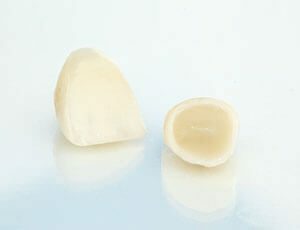 This top grade material is a breakthrough in dental technology offering highly durable, strong dental crowns in an appealing translucent colour, with no unsightly metal alloy base, so your gum-line doesn’t give away the fact that you have a crown! When there is a loss of teeth in an area with a short span, a restoration called ‘a bridge’ can be used to replace the missing crowns, utilising the teeth on either side of the gap. If you require further information about our dental crowns and bridges or would like to arrange a private dental consultation, please contact our office or complete the contact form and one of the Wentworth team will get back to you shortly. How much does a Dental Crown or Bridge cost? Only following a private consultation with our experienced Dental Surgeon will we be able to advise on the best type of crown or bridge for your particular needs. We offer a range of dental crowns and bridges including E-max crown from £522.50, and Gold crown from £425. Call our office today to book your private consultation.